Hear the horse’s hooves sink into the velvety snow as your sleigh makes its way into the winter darkness of this unspoilt landscape. Sitting snugly wrapped in warm blankets, you’ll be able to savour the beauty of the surroundings, with the sound of the horse’s bell echoing among the trees the only thing you’ll hear. 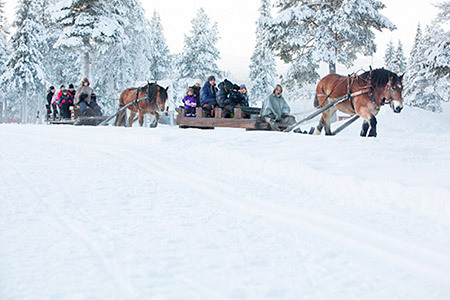 Enjoy the tranquillity of this wonderful winter landscape by horse-drawn sleigh.